You’re looking at day four of our Rainbow Week series. Click here to start on day one. Need a little break from baked goods? Rainbow cakes are a lot of fun and make for great eye candy, but there are other options for impressive and vibrant food as well. 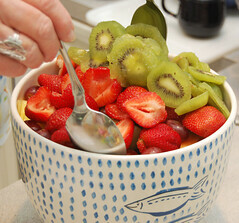 I hijacked this fruit salad recipe from my mom. In fact, I took the photos for this post the last time she made it (which I hope made for some cool action shots). 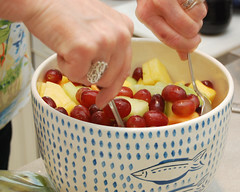 I love the fruit salads that she makes because they always have very sweet and excellent glazes. This one packs a little more punch than some of my other favorites because it comes with tequila! The tequila is noticeable, but not overbearing. You could leave it out if you really wanted to, but why? 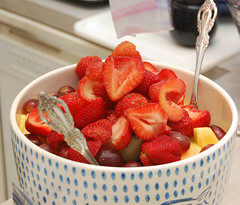 This recipe makes a very large bowl of fruit – perfect for entertaining at cookouts or dinner parties. If you’d like to adapt it to every day use, simply cut the recipe in half. 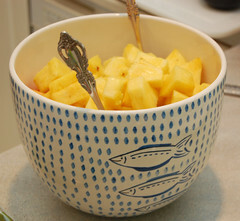 You can probably tell this from the photos, but if you do decide to make a large batch, make sure you use the appropriate size bowl. 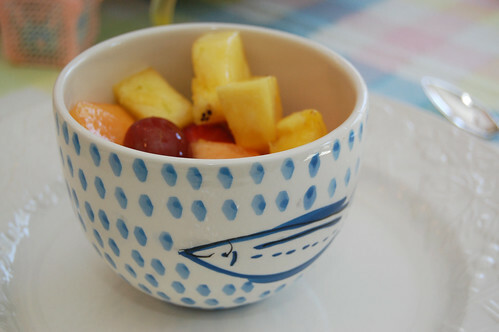 We ran into some overflowing problems and had to transfer the fruit to a larger, wider bowl so that we could toss it with the glaze. Heat sugar and water to boiling in small saucepan. Reduce heat, and simmer uncovered for approximately 2 minutes, stirring constantly until sugar is dissolved. Remove from heat and stir in lime juice and tequila. Let stand to cool. 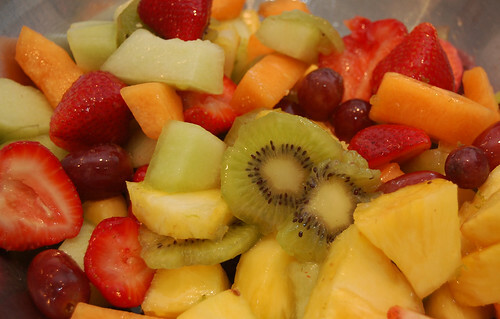 Cover and refrigerate for approximately 2 hours. Stir in lime peel. 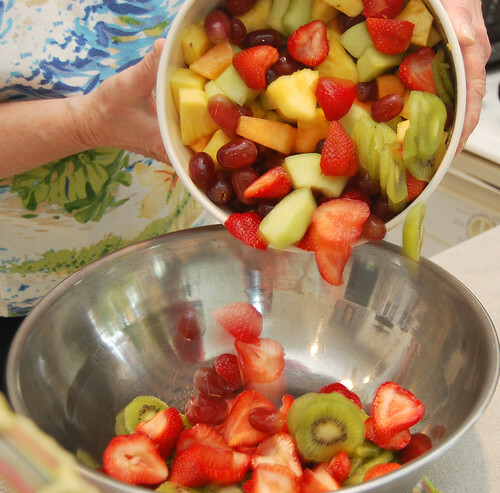 Carefully toss fruit and lime mixture. Serve immediately. Or, click here for a version without tequila (boo! ).